A couple of weeks ago Google released their Google Earth version 6.2. Unless you opted out, they upgraded your plug-in software automatically. The previous version had several bugs that affected CloudAhoy users (and I, among many others, have reported and urged them to fix these bugs). The bugs have been fixed, so 6.2 is good news. But with the good news came some bad ones: the new version crashes a lot while running cockpit view animation. I have received reports from several users, all running on Macs. Hey, are there Windows users out there who get this problem too? When the problem happens, do like Google says: reload the page. It helps… until the next crash. I verified: this problem affects all the other camera movement applications that I tried, including Google’s own. That’s bad news, because if the bug were in CloudAhoy, I would have been able to fix it myself. I found that if you get frequent crashes in one browser, switching to another is likely to help. Today I failed to get the screenshot above while running in Safari – it worked beautifully for 15 minutes. I switched to Firefox, and it crashed immediately. Other days, it crashes a lot in Safari but not much in Firefox or Chrome. I could not get the plugin to crash on Windows XP (both IE and Firefox). Maybe because it runs a 32-bit plugin. 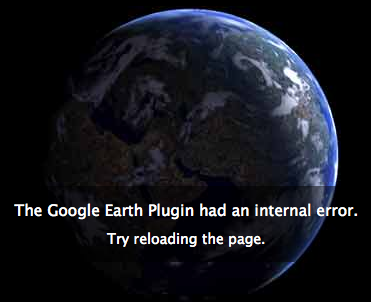 (2/29/2012) I modified the interface between CloudAhoy and Google Earth, and GE seems to crash less now. I also found that when it does crash, the best thing to do it to restart the browser (as opposed to simply refresh the page). After a restart, crashes are much less frequent.